Rúbrica Maritime opens 2017 with the shipment to Algiers of a series of modular cubic molds for different volumes. These molds together with the formwork for the Crown-wall in the counterdike are the first elements sent for the execution of the works in the Marina Bay d’Alger. This project that initially had to be completed in the same year 2017 has been finally delayed because of difficulties on site, having place the second shipment with the formwork for the construction of the main Crown-wall at the beginning of 2018 and being still pending a final delivery of molds that will serve for the execution of the Pile-heads and construction of the capping beam on a submerged wall built with prefabricated blocks. In the national territory, the year was inaugurated with the construction of a submerged wall formwork for the construction of the interior shelter breakwater in Puerto del Rosario, Fuerteventura. Said formwork is capable of performing different quay alignments, varying the dimensions thereof to get adapted to each of them, in addition the mold has the peculiarity of being provided with internal negatives to create a water redirection circuit in one of said alignments. Other works initiated for the local market last year but which have already concluded in the present 2018, include the rehabilitation works of the Crown-wall in the ports of Castellón and Escombreras, Murcia. Last year and also for the port of Castellón a single-arm friction clamp with 1000 cycles of use was manufactured for the placement of 18-ton blocks in the breakwater of the port. The same client requested later another clamp suitable for handling concrete and limestone blocks, having the clamp a variable clamping width between 1.4 m and 1.7 m and being able to lift a maximum weight of 14 Tn. Two of the most important works carried out last year have been the formwork for a capping beam on a sheet-pile wall in the port of Haifa in Israel, the formwork have to execute three different alignments with different geometries and characteristics in each one of them. And the mixed formwork of self-launching system and floating tables for the construction of the Syncrolift wharf in the port of Barcelona. 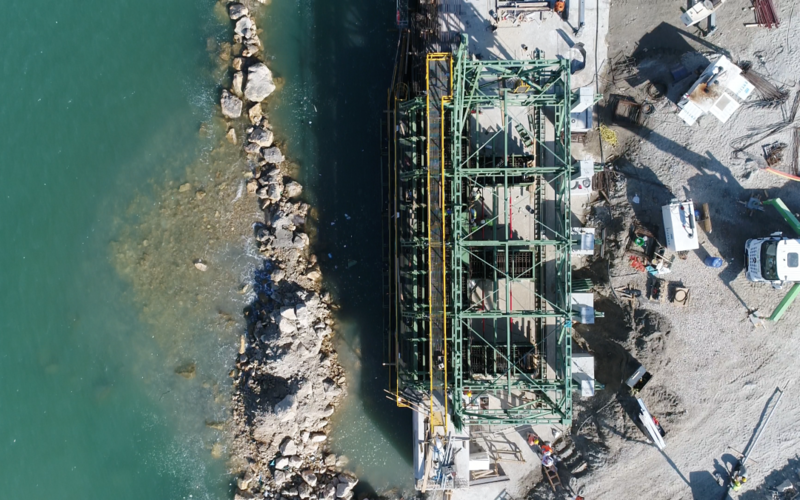 After the reception and good operation of the formwork for the quay Q8 the port of Haifa requested 2 additional units to shorten the execution times of the work. Finally, it is to be mentioned the manufacture and supply of 50 molds for the construction of 2.4 m3 Core-Loc blocks for the port of Doha in Qatar.